Despite what you may have heard, the design for the uniform that Northwestern University football players will wear in honor of wounded warriors is not meant to represent blood splattered over the American flag, according to the company that makes the uniforms. Northwestern players are expected to wear the uniforms during their Nov. 16 game, after which the players’ jerseys will be auctioned off to raise money for the Wounded Warrior Project, said university spokesman Paul Kennedy. Both Northwestern and the company that designed the uniform have had to do some explaining since people observed online that the uniforms’ red streaks make it look like the players are dripping in blood. 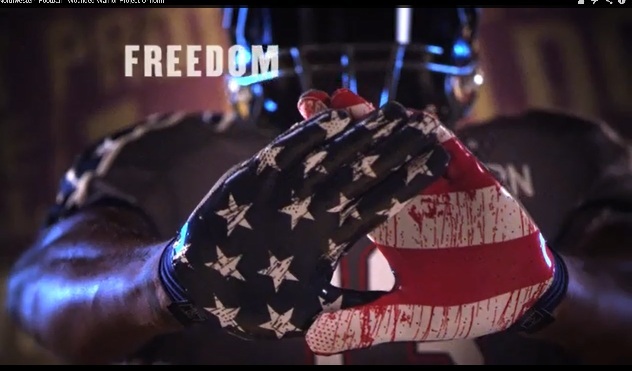 “Isn’t ‘flag covered in blood’ a little on-the-nose for something honoring a group that operates programs for injured veterans?” Barry Petchesky of Deadspin posted on Monday. The red streaks actually represent an American flag that is old because it has been flown for a long time, according to Under Armour, the Baltimore-based company that made the uniforms. Blue streaks are also part of the design, although less visible. A spokeswoman for the Wounded Warrior Project did not return phone calls and emails asking for comment. Can officers and enlisted airmen be "friends" on Facebook?